Thicker textured silk, great for abstract painting and dyeing, also good for printing. Good for soft furnishings, placemats and structured garments such as waistcoats. Unsuitable for most resist techniques. Natural shade. 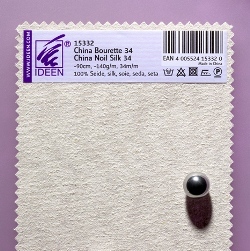 Silk noil is also very popular for embroidery, and is ideal for silk ribbon embroidery.